Driving around the city, have a look around—what do you see? The buildings, the scenery, the traffic jams, the hawkers, the Toyotas? Yes every third car you see on your average roads in Pakistan is a Toyota brand. 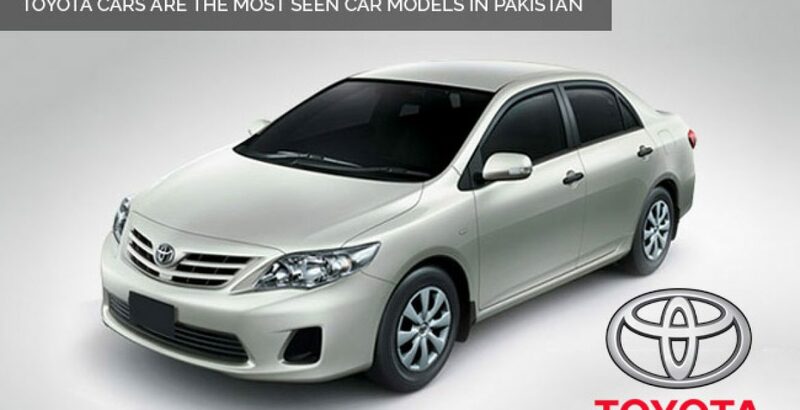 Toyota’s name has become synonymous to the word car in Pakistan. The models range from the seventies, old and shabby condition to the latest chic Grande. A whopping number of 12,875 corollas were sold in the second half of 2013 alone. It seems like corolla is the only reliable and the oldest name in the country. Although the trend of imported cars has increased, that has had no significant impact on Toyota’s sales in Pakistan. Toyota still holds a major chunk of the market share and owns 70% of the shares in the category of 1300 cc. The percentage speaks volume of its dominance on our roads. It is a way more than half of the market and this is precisely the reason that our roads are filled with Corollas of every size and model. You will find diehard fans of Corolla who have always bought it, be it new or second hand. They are reluctant to switch to any other brand. It has been a reliable name and a very popular brand globally. It ranked the highest producer/manufacturer of cars worldwide in 2012. It was introduced in 1966 and has been manufacturing outclass vehicle since then, thus creating a trustworthy and dependable name. Corolla became the best/highest selling car by 1974. Toyota ventured into Pakistan in 1993 before other international names like Honda. Hence it grabbed the market that was untapped by the local car assembler, like Pak Suzuki. It offered better quality, safety features, easily available spare parts, solid metal body, much better fuel efficiency and available in a variety of colors ( Super white, amber, ivory, black, steel blue, steel gray, Barcelona red metallic to name a few). It developed a trust amongst the car drivers and they preferred to buy Toyota each time due to the trust relationship. The first mover or the early mover advantage, that Toyota got, gave them a head start to capture the mass market (in car owning segment). Due to the reliability and the brand name, it created for itself, Toyota developed a good re-sale value. People buy it for its resale value apart from the features and affiliation with the car. Hence the old cars are sold and resold and people are willing to buy them second hand more than any other car. This is one major reason that you will always find different models of Toyota on the roads that you travel around especially in smaller cities where people can only afford second hand cars due to their budgets. Pakistan has a big middle class and they demand value for money. They want a car that will not only give them a good mileage but also has a good resale value.The trend is slightly less in the metropolitan cities as people can afford new cars. Even then you will often see an old 80’s or 70’s model cruising around. It seems like generations of Corolla have been kept alive on our roads. It is for sure to be a feather in Corolla’s cap to keep its customers satisfied and develop such a long lasting bond of trust and value.